In 1981, the great communicator — Republican Ronald Reagan — was in the White House, and a self-described socialist — Bernie Sanders — was the Queen City’s mayor. Council Dems were bitter that their candidate, Gordon Paquette, had lost by 10 votes to Sanders. So they set out to block almost every appointment the Brooklyn carpetbagger tried to make. Reasoning? Keep the Paquette folks in power until they could un-elect Sanders. It didn’t quite work out that way. Their power ploy catapulted Sanders all the way to the U.S. Senate. That June, Dems blocked Sanders’ appointment of the city clerk, assistant city clerk, treasurer, assessor, city attorney, and public health and safety officer. Their efforts to bring city hall to its knees promptly backfired: It made Sanders, not the Dems, look virtuous. That prompted their slide into political oblivion; the Dems eventually lost all but two of the council’s 13 seats. It wasn’t until this year that Democrats came close to an outright council majority. They hold seven seats, and the council prez is a Dem. Today the great White House communicator is Democrat Barack Obama and Progressive Bob Kiss is Burlington’s mayor. The city’s Dems are positioning themselves to block Larry Kupferman’s reappointment as head of the city’s Community and Economic Development Office. Ditto Kiss’ efforts to replace Parks & Recreation Director Wayne Gross. The Dems also have “issues” with Public Works Director Steve Goodkind and Chief Adminstrative Officer Jonathon Leopold, but those two positions seem safe — for now. Franco recalls that Sanders actually took the council to superior court to break the logjam, but the judge ruled it was a political problem, not a legal one, and refused to get involved. Politics eventually broke the Democrats’ grip. Sanders reached out to Republicans on the council to create a governing coalition. Then, in the 1982 elections, the Independent Coalition (a precursor to the Progressive Coalition) won five of the council’s 13 seats. Back to 2009: Fresh from their double-veto Statehouse smackdown, Democrats around Vermont have a bit more swagger in their stride. The quiet and reserved Mayor Kiss may be their next political victim. Think about it. It has to gnaw at some Dems that Progressives have had a near virtual lock on the Burlington mayor’s office since 1981. And Kiss’ recent reelection bid, like Sanders’ first victory, was razor thin. With only three Progs on the current council, Kiss has a lot of convincing to do. On Monday night, he met privately with a handful of Democratic city councilors to discuss the process of mayoral appointments. “I think the situation can be best described as a communication problem,” said Councilor Ed Adrian (D-Ward 1), who chairs the Democratic caucus. He said the Dems told the mayor they wanted the council kept more closely apprised of city business. I wonder, does Adrian mean the entire council or just the Democratic caucus? Kiss says he has kept the council posted on his administration’s doings and is puzzled why the Democrats alone have chosen to thwart his appointments. “It’s clear to me as a mayor that I have the responsibility to build a team to do the work of the administration,” said Kiss. He says the communication breakdown appears to be on their end. Kiss gave councilors four days’ notice about his appointments, yet they told him only four hours before the council meeting that they had “problems” with his appointments. Kiss said he met “at the 11th hour” with Ward 6 Democratic councilor Joan Shannon to hear their concerns. He then withdrew his appointments and agreed to have them considered on June 15. The council does play a role when it comes to high-level appointees, similar to the “advise and consent” capacity of senators in Montpelier and Washington. And while you sometimes see political antics crop up in D.C., you never see that in Montpelier and it’s practically unheard of in Burlington. The occasional residency requirement discussion, maybe, and that’s about it. The city council will take up Kiss’ mayoral appointments this coming week, but it’s not yet clear if Democrats will fully support them. Council President Bill Keogh (D-Ward 5) said he has no predictions about Monday’s outcome, but stressed that the 2009 Democratic caucus is nothing like the 1981 version. “As I recall, that one was a lot more aggravated, and I’m not sure that we’re that aggravated,” said Keogh. All for One — Sports is all about teamwork, and nobody knows that better than the state’s best high school long jumper — Burlington High School’s Minh John Lu. A BHS senior, Lu was disqualified at the Essex invitationals on May 30 after a Middlebury High School coach complained about a logo on Lu’s compression shorts. Never mind that the shorts are part of the BHS uniform, or that team members have been wearing them in competitions throughout the year. State rules govern how large a logo can be on an article of clothing worn during competition. The decision could have denied Lu a shot at a New England title, but teammates, parents and community members rallied around the athlete. There was also media attention, including a post on the Seven Days staff blog, Blurt. Last Wednesday, the Vermont Principals’ Association overturned the disqualification ruling. “There was no reason to punish a student for something the adults did wrong,” said Bob Johnson, VPA’s activities director. Kevin Chu, one of Lu’s teammates and a top-ranked hurdler, led the effort to reinstate Lu to Vermont’s New England squad. He started a Facebook group — “Protest the unjust disqualification of Minh John Lu of Burlington” — that in days grew from a handful of supporters to 900. Group members sent emails to the VPA urging them to overturn the DQ. Chu threatened to pull out of the New England championships to protest the ruling. In the end, Lu wouldn’t allow him to back out. Lu worried his predicament would distract the team from its effort to win a state title for the first time in decades. It didn’t, as the BHS team took the crown before a hometown crowd. Lu and Chu now turn their attention to this weekend’s big meet, which will also be held at BHS. Barack the Quad — Will Pres. Barack Obama make the trek to Vermont to celebrate the 400th anniversary of Samuel de Champlain’s “discovery” of Lake Champlain? There is a precedent. One century ago, Pres. William Howard Taft stopped by for theTricentennial fête. That’s more than Pres. George W. Bush did for Vermont while he was in the White House. He thoroughly snubbed Vermont — the one state he never visited. A letter signed by Vermont’s congressional delegation, the governor and Burlington’s mayor went out to Obama months ago. No official word yet on whether the prez has accepted the invite. It’s not beyond the realm of possibility. Obama has key allies in our three-member congressional delegation, and Gov. Jim Douglas seems to be his BRF — Best Republican Friend. To cap it off, finance chairwoman for the Democratic National Committee is Jane Stetson of Norwich — she was handpicked for the job by Obama. She and her husband William Stetson held an early fundraiser for him. If I were you, I’d keep your summer weekend plans, shall we say, flexible. Silencing the Critics — Another panel member resigned from the dysfunctional Vermont Commission on Native American Affairs just as last week’s report in “Fair Game” went to press. Paul Bell is the fourth member in less than a year to step down because of conflicts with three gubernatorial appointees. “I hope that this sends a strong signal to both the Vermont legislative assembly and also to the governor’s office that they really need to step up to the plate and address the Native issues in Vermont and to finally fix the broken Commission,” said former chairman Donald Stevens. Is the guv listening? Not likely. “Fair Game” also learned this week that the state has stopped paying to have commission proceedings recorded. Sinking Subs — The Burlington Free Press may still technically be the state’s largest daily newspaper, but it continues to shrink — in more ways than one. The latest? The Gannett-owned daily is discontinuing many of its home-delivery routes. No word from Freeps top brass on how many routes have been cut from circulation. Studio Shuffle — More changes are in the works at the state’s largest TV station, “Vermont’s own” WCAX-TV. Two weeks ago, longtime news director and anchor Marselis Parsons announced his retirement after decades at the helm. At the same time, the station stated that Anson Tebbetts, a former WCAX reporter and Douglas administration official, would take over as news director. Tebbetts began last week. The station then surprised many in the Vermont media by tapping reporter Darren Perron as the new 6 p.m. anchor, passing over longtime 11 p.m. anchor and news producer Roger Garrity. It was nothing personal, management said. 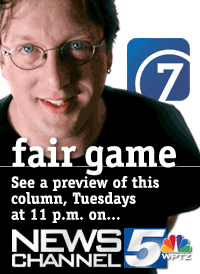 Though Perron takes over the 6 p.m. slot later this summer, “Fair Game” has learned that, starting in July, Perron will replace Garrity as anchor of the 10 p.m. webcast and the 11 p.m. newscast.